See... I told you I'd give you credit! This is a deceivingly hard question. I can quickly tell you about my most favorite dish ever (a pasta eaten in Florence during white truffle season) or what the one food I would choose if I had to eat it exclusively for the rest of my life (pizza), but this one took some serious thought. What sandwich encapsulates who I am? 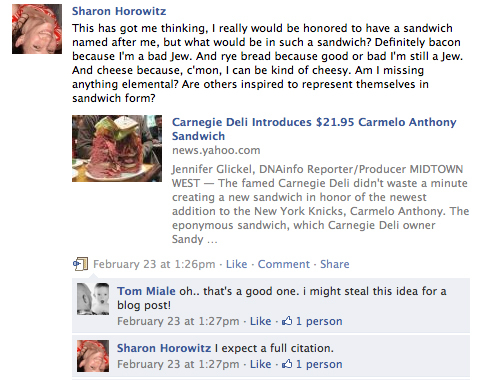 For a bit of added pressure, Sharon totally nailed her sandwich. If you can’t read it, click the above image to zoom in. After months of pondering, I think I have come up with the sandwich that perfectly sums up who I am. Unfortunately it’s already called something….. (drumroll)………. 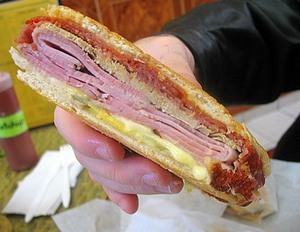 Some people call it “The Mixto”, or the Cuban Press. The ingredients are always debated, but the version that sums me up is the traditional kind. You HAVE TO start with with Cuban bread. Custy on the outside but soft on the inside. The bread needs to be lightly buttered on the crust. A coat of yellow mustard is spread on the bread. Then comes the inside; slow roasted pork, slices of ham, Swiss cheese, and thinly-sliced pickles. Throw it all in to a sandwich press until the cheese melts and the outside gets brown and toasty, and you’re done. Lets dissect this, shall we? Crusty exterior, but soft on the inside… non-pretentious (yellow mustard! )… 2 types of piggy… a little cheesy…mostly salty, but a little bit of sweetness (just enough, in my opinion). Yup, that’s me. So, here’s some homework for you. Wow, your sandwich is way more thoughtful than mine. Puts pork and cheese on rye to shame. I think about food way too often.